May as well start this Thread because I believe that few of South's oldest NABIs have been retired already but unsure with 6600s. I saw few NABIs are already sitting with bunch of dead Orion VI 6000s at the back of South Holland Division. On the 6600s, look at the Inventory topic spreadsheet. Doing that, the following are indicated as South-2, and thus dead: 6629, 6634, 6635, 6677. Also, a number are listed as Ravinia. Now over 80% of the 2003's are gone, the remaining ones are at West and only 3 6600's operate and 10 6162's are operating. A few buses run during the weekends, and I will miss these buses a lot when they leave. Thankfully we still have a lot of 6262's still operating to this day. 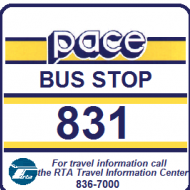 In that the current Pace procurement is for 78 40 ft. buses, that's about what one would expect. Not a fan of NABIs but I really miss them (6162s) a lot at South Suburbs (South Division), And I believe all the 6162s that were formerly South Divisions are all gone since most of them were already bad shape and had way more miles than other ones that were from other Divisions.. I bet 6666 will be the last (35 foot) left in service soon. Today afternoon, when I was on my way to Markham Courthouse, I did spotted #6672 pulled by Towed going northbound on Dixie HWY while I was going southbound at 170th, I assumed that was towed from West via I-294 to South Division going Bye Bye. So I guess for 6600s is down to two? So the 6600s are retired? Thats the only unit active or something? 6612 is still out there, 6651 I am not sure about that, 6669 has not been out for like 2 weeks or something. 6651 is actually still out there because it is on the 322 this morning. Yesterday (Black Friday) I rode 6651 on 322. Going east it was over half an hour behind schedule due to all the traffic at the malls, mostly Oakbrook Center. The interior panel above the windshield was unlatched and swinging open the entire time. Neither of the doors closed completely and a cold draft blew through the bus. When the bus hit a bump and I almost fell out of my seat, the driver remarked “Sorry! This bus isn’t in the best condition”. Does it seem like any thought is being given to which route to assign the 6600s to? 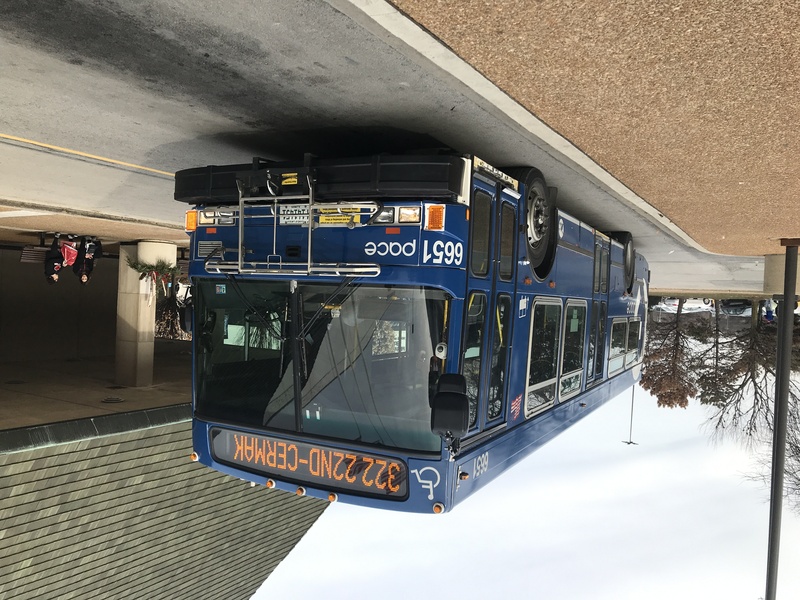 I was surprised one was on 322, on Black Friday, since the route serves three major malls. The bus was almost full for most of the route, especially when a guy brought a dozen balloons on board. The 6600s are probably randomly assigned at this point, since there are only two left and will be gone soon. 6612 is the other, which was on 302. The south parking lot at South Holland is full of 6600s. There’s also a CNG there completely covered by a tarp. The CNG would probably be #18506 that got into a accident Nov 13th. The pictures are painful to look at. The CTA bus #1088 doesn't look too good either. Both are out of commision for awhile. Well it's a rear end collision which means one thing unless the Pace bus was backing up the cta bus hit the pace bus. That looks to be at least a 25 mph accident. Which means accident happened at 103rd and Blackstone. The Pace bus was a SB 353 turning left from WB on 103rd going south on Blackstone to enter the Bishop Ford when hit by an EB 106. Yeah, not sure why this bus is still in service, especially on 322 on Black Friday. I'm guessing there's a shortage at West right now. I'm sure the 6162s are probably just as bad. The third 35-ft NABI has been reinstated for being missing for about 3 weeks, it's 6669. 6666 is probably retired as it last operated in August. Today is my lucky day because I got two 2003 buses, 6237 and 6651. 6651 is the last 35 ft. I needed because I already rode 6669 and 6612. From Pace831's post, the panel above the windshield was loose as he said, but it is still pretty cool how the next-stop interior display was working. It did hit bumps during the trip and I almost fell out of my seat. It's sounding great, and if 6666 ever comes back, my goal is to try to get that bus because out of all the remaining 2003 buses out there, I only need to ride 6227, 6255, and 6258. 6237 is in decent condition. Nothing too bad about that bus. I thought this bus was retired, but I was shocked when it came back as I have not seen that bus since spring. And that is 6257. I thought the remaining ones (6210, 19, 24, 27, 35, 37, 40, 46, 51, 55, 58, 61) were the only ones remaining but this shocked me very much. So that one will be added to the active side until it goes back to being gone. I told the driver this was the worst bus I ever rode. She said it was the only bus they had for her AND she had to wait ONE HOUR at the garage to get it. She was just glad to have heat. She didn't drive more than 30mph along the route. And it's out there again today, same route. If it wasn't well documented before that West is enduring a bus shortage, this clearly puts that issue in the forefront. The 6600s should've been long gone by now and the 6162s should be right behind them. I wonder with some route eliminations recently if any 2600s make their way West, but I doubt it. Nothing short of replacements will do. But the questions of how many, what type, and when have yet to be answered. I don't think West could poach any more buses from other garages. Today I got 6257 (Yay!) and 6262, which replaced 6651. I have no idea what happened to 6651, as it was supposed to be the bus I take, but it might have had a problem and 6262 had to come. 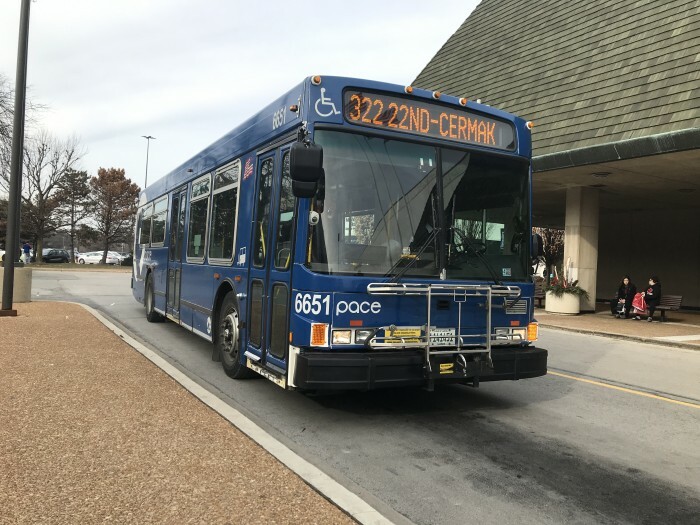 Also, when we came to Oak Park, there was an emergency with one of the buildings, and I originally thought 6563 had a sick passenger or a car hit it, until I came to the front.